Brood patch — An area on the stomach of the bird that, prior to the laying of eggs, loses its feathers and swells from retention of water and enlargement of blood vessels in the area. These modifications help the bird keep its eggs warm. Brood patches can develop in both male and female birds. Secondary cavity nesters — birds that nest in cavities they do not create. Eastern Bluebirds and Tree Swallows use cavities formed by natural events (decay, erosion), or by other species. Many of our woodpecker species are primary cavity nesters, creating nesting holes in trees and posts. This is one reason woodpeckers are important parts of an ecosystem. Cloaca — The opening at the lower end of a bird’s digestive track. From this opening, also called the vent, the bird expels feces, urine, sperm, and eggs. Crepuscular — Birds that are active at dawn and dusk. 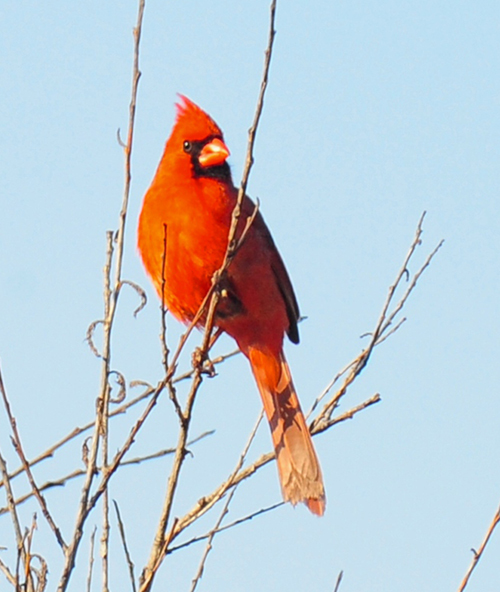 Our cardinals can be called crepuscular. Dabbling — A method of feeding in which the bird moves its beak rapidly on the surface of the water to pick up plant and animal material. Mallards, teal, wigeons, and pintails are dabblers. Dabblers also can be seen tipping bottoms up to forage for submerged food. Dawn chorus — The collective sound of many bird species singing. Dawn is the time when the largest number of species are singing, more frequently and with more energy and variety. Here, this is best experienced in spring and early summer. Definitive plumage — The plumage of a fully mature bird. Bald Eagles, for example, do not reach definitive plumage — white head, white tail — until they are five to six years old. Some birds achieve definitive plumage in their first year. Dialect — Variation of the songs of one species of bird by geographic region. The songs can be similar but different for dispersed populations.